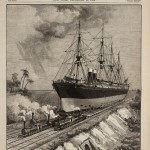 The Panama Railroad as depicted on the cover of Harper’s New Monthly Magazine, (vol. 18, no. 103, January 1859), with an annotated page from A.B. Nichols’ copy of the same issue. 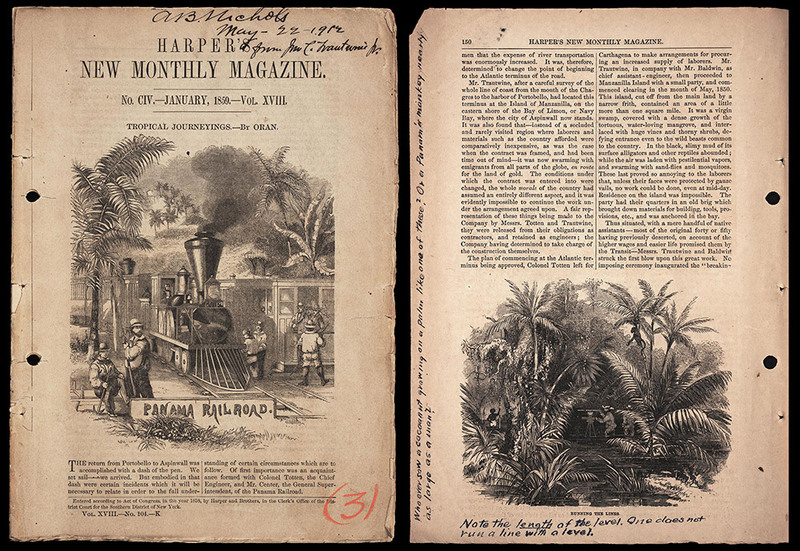 Harper’s New Monthly Magazine published an early account of the Panama Railroad a few years after the railroad was completed. 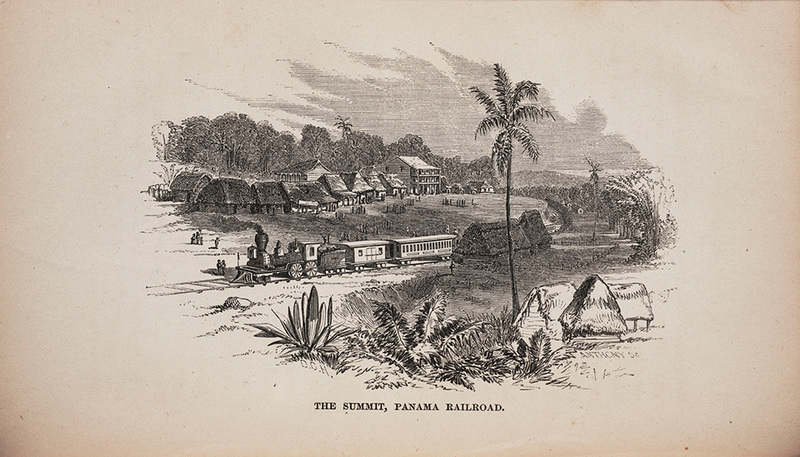 Armchair readers who had not been to Panama would have been captivated by the images and descriptions of the railroad and the sites that one could expect to see on a trip across the Isthmus. But to A.B. Nichols, who was familiar with Panama and the railroad from his years of work on the canal, there were many inaccuracies. He made snide comments in the margins of his copy to point them out. 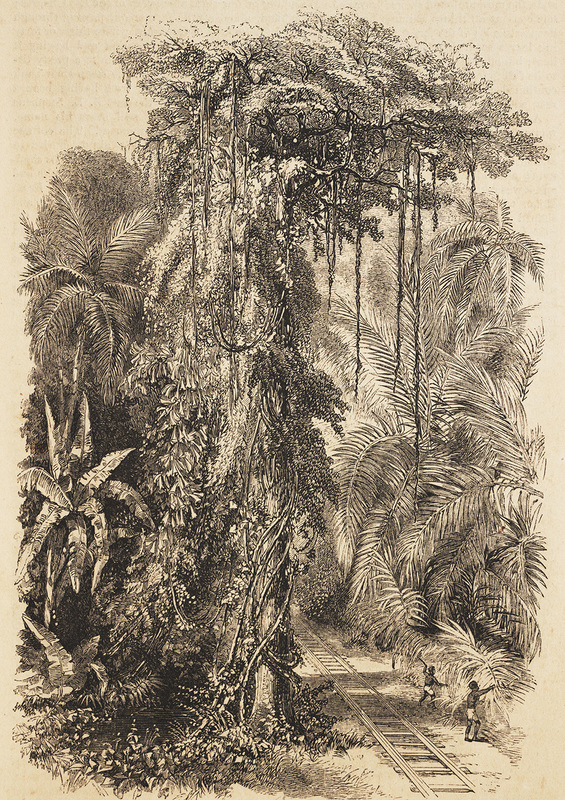 Whoever saw “a Panama monkey nearly as large as a man?” he wrote next to one illustration. Early view of Culebra, which was known as Summit during construction of the railroad. 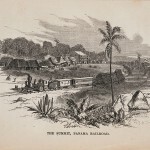 From R. Tomes, Panama in 1855 : An account of the Panama Rail-Road. New York, 1855. The Panama Railroad was completed at Summit in 1855, a point about 10 miles northwest of Panama City on the Pacific side. The last rail was laid there on January 27, and the completed line immediately attracted passengers. Robert Tomes was one of them. He published an account of his trip on the new railroad during that first year of its operation. Summit, or Culebra as it was later called, had been for some time the terminus of the railroad while under construction. Its principal feature, Tomes reported, was a “groggery”, where passengers bought bad brandy before continuing by mule to Panama City. Once the railway line was completed, Summit became only a railway station where passengers had barely enough time to buy a few oranges from street venders at exorbitant prices before completing the journey. As completed in 1855, the Panama Railroad line was about 47 ½ miles long. It started in the town of Aspinwall on the Atlantic side of the Isthmus. Since the town was built as a terminus for the railroad, its main street was the railway line, named Front Street, as it was adjacent to the bay. 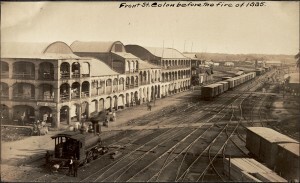 When Ferdinand de Lesseps and other travelers arrived in Panama, they usually stepped off the ship at Aspinwall, or Colón as it was renamed. They could walk directly from the wharf to the train tracks on Front Street, get on the next train and begin the trip across Panama. 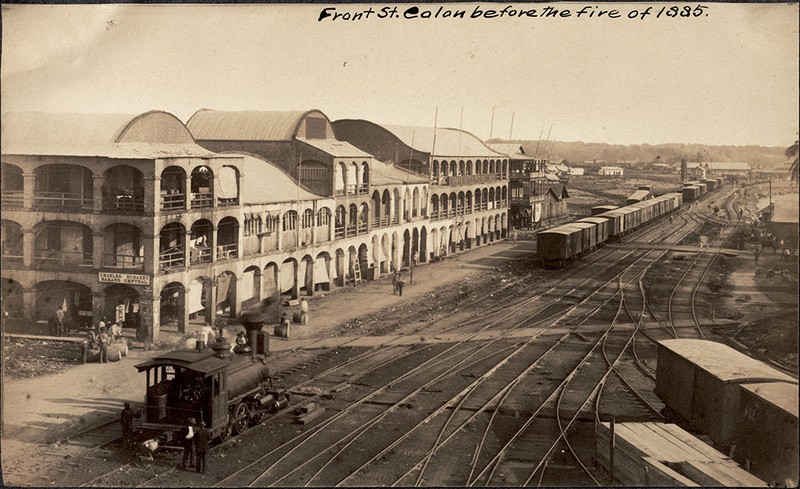 The Atlantic terminus of the Panama Railroad was named in honor of one of the railroad’s founders, William H. Aspinwall, but the name was later changed to Colón, the Spanish form of Christopher Columbus’s last name. 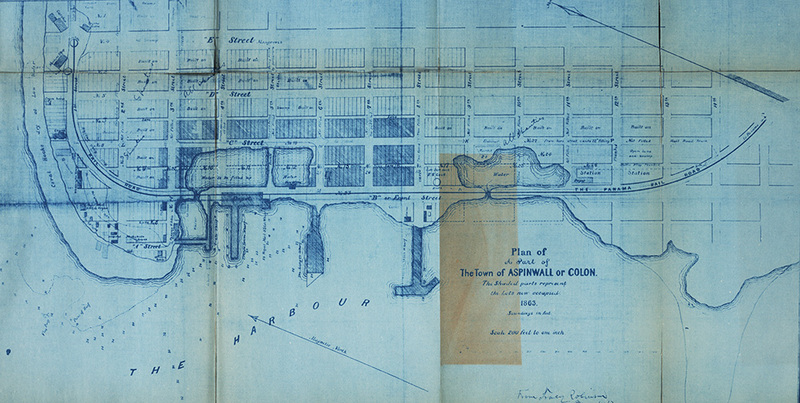 For a while, the town had a dual identity, as shown on the early blueprint, which allows for both names. Railroad people preferred Aspinwall, while the Columbian government chose Colón. 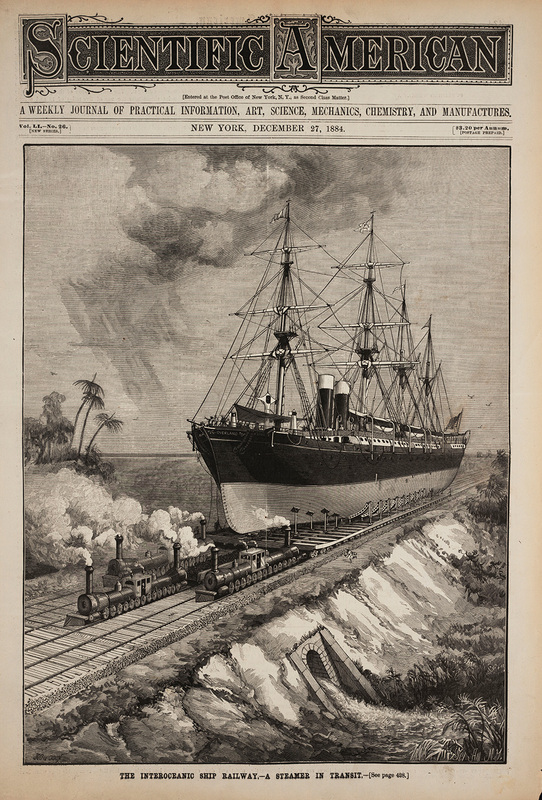 The Explorer in the Colorado River, reassembled after crossing Panama by rail. 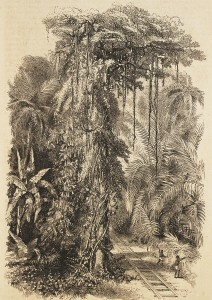 Illustration by J.J. Young from a sketch by H.B. Möllhausen. From J.C. Ives, Report upon the Colorado River of the West, Explored in 1857 and 1858. Washington, 1861. 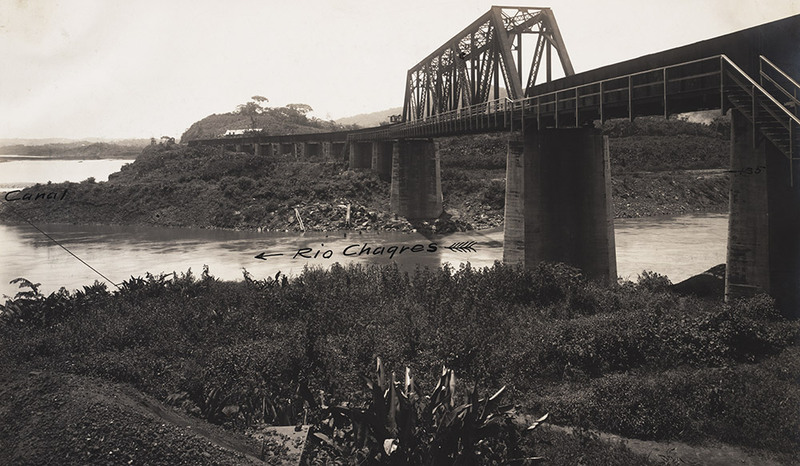 The Panama Railroad crossed the Chagres River at Barbacoas, an Indian word meaning “bridge.” It is about 23 miles from Colón and halfway to Panama City. The bridge was a massive wrought iron structure, more than 600 feet in length and rising 40 feet above the river on stone piers. In November 1879, only a few weeks before Ferdinand de Lesseps arrived in Panama for the ground-breaking ceremony, torrential rains caused the river to rise 46 feet and engulf the bridge in the worst flood on record. When de Lesseps arrived at the bridge with the party of visiting dignitaries, the train stopped and passengers had to walk across on planks that covered the gaps to transfer to another train on the other side. 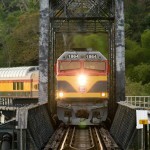 The bridge had been out of service for freight and passengers for five weeks, but in the official record of the visit the incident received only passing mention as an unexplained delay at Barbacoas. Stephens’ Tree, named in honor of one the founders of the Panama Railroad, John L. Stephens, was a landmark along the line. 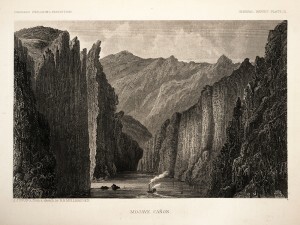 Pictures of it occur in early travel accounts from the 1850s, shortly after the railroad was completed. In those pictures, the tree is shown next to a single track. 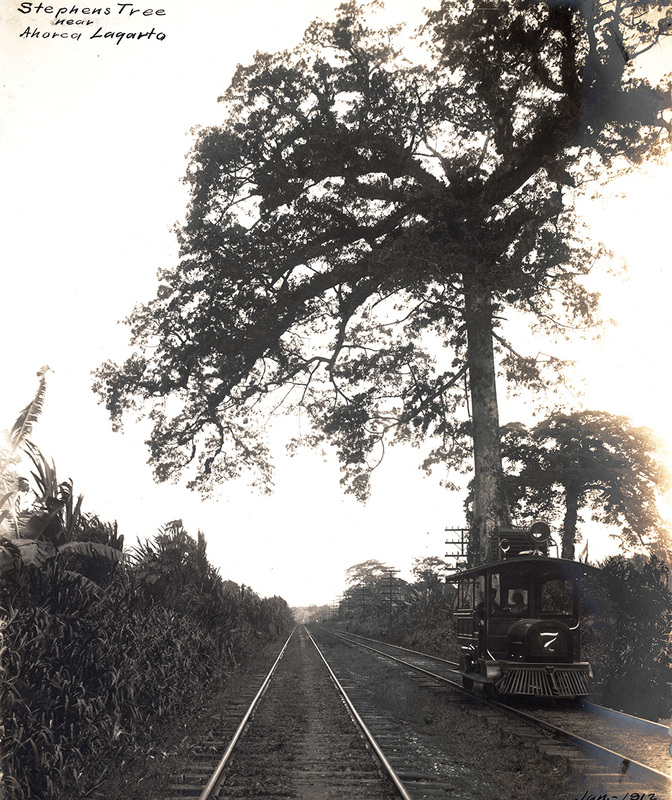 The double track shown here was one of the improvements made after the Americans began their efforts in Panama. John F. Stevens, the American engineer who came to lead the project in 1905, found that the Panama Railroad he inherited was hopelessly out-of-date and described it as a “phantom railroad.” Double tracks were installed across the Isthmus, dock capacity was increased, heavier rail was installed, and bridges were strengthened. By December 1905, the line had been rehabilitated, and Stephens’ Tree had been preserved through it all. 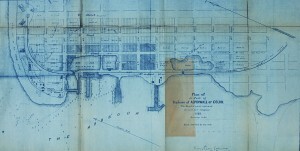 One of the first priorities of John F. Stevens when he became chief engineer of the canal project in 1905 was the rehabilitation of the Panama railroad. 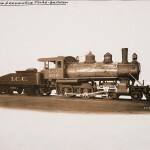 Within weeks of his arrival he placed an order for 120 Mogul locomotives, which had 2 leading wheels and 6 drive wheels. 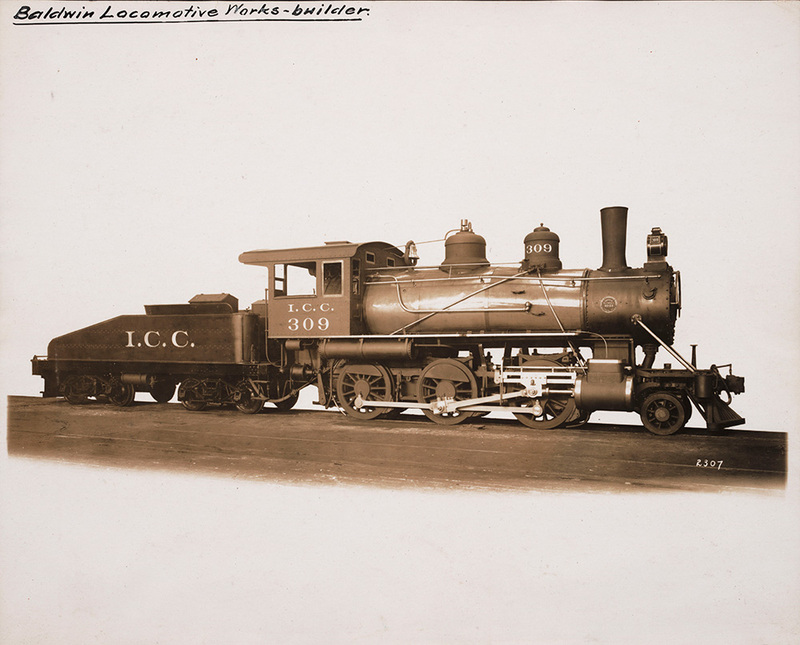 More orders followed, and these Mogul locomotives became the principal type of locomotive used in the Canal Zone during construction. The Isthmian Canal Commission placed large orders with several builders for Moguls, including the Baldwin Locomotive Works in Philadelphia. A distinctive feature of them all, regardless of manufacturer, was the long and low sloping tender, designed for greater ease in reverse running. They were also designed to avoid toppling over because of the uneven and rough roadbeds over which they had to run. 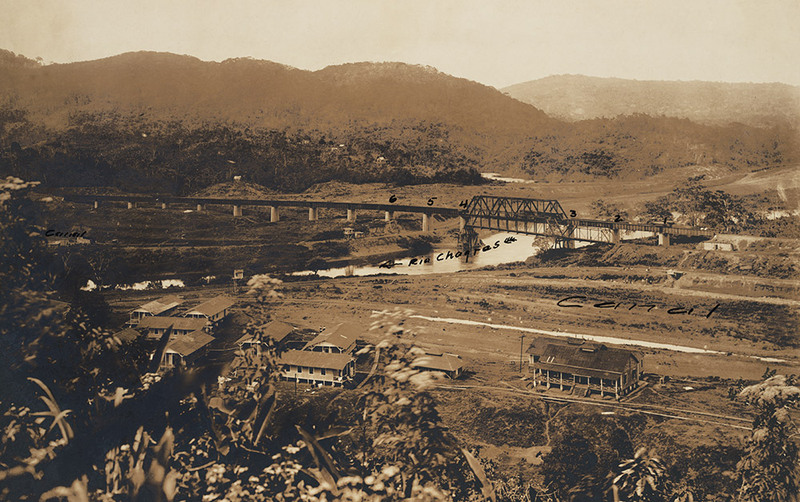 The railroad was always seen as integral to any plans for building a canal in Panama, as it was necessary for transporting not only people but equipment, supplies, and excavated dirt. 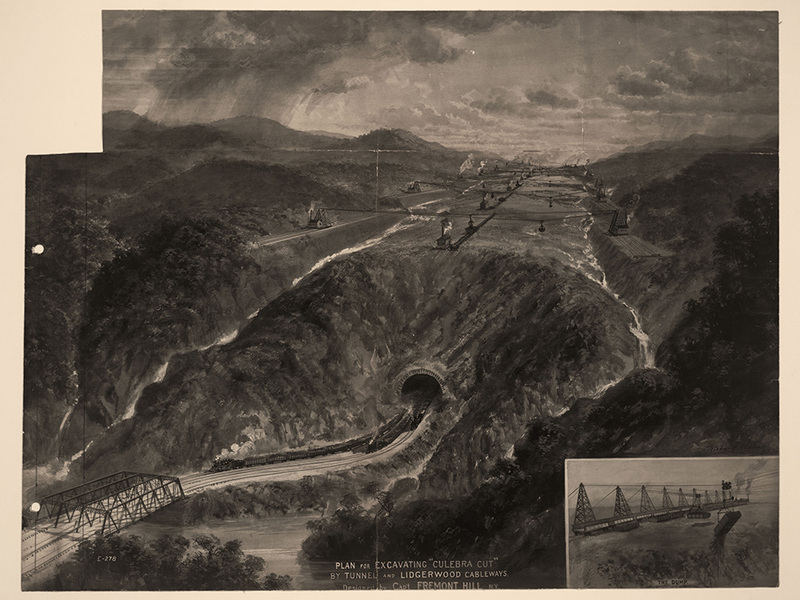 This undated painting shows an idealized plan for excavating the difficult Culebra Cut in the mountains at the continental divide in Panama. Excavation from the top is being done by the use of cableways to haul away and dump the spoil. A massive rail operation is meanwhile hauling away dirt and rock from below, carrying the spoil from a tunnel after it would have been loosened by explosives. 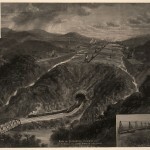 Eventually, the two operations would meet to create the huge cut through the mountains that was necessary for the canal. A steamer in transit across the Isthmus of Tehuantepec in Mexico, as proposed by James B. Eads. From Scientific American, December 27, 1884. In 1880, American engineer James B. Eads, reacting to the 1879 proposal from Paris for a Panama Canal, proposed a giant railroad to haul ships across Mexico instead. There were many advantages, including cost, speed of construction, and even the speed of transit from sea to sea. Eads’ plan was to lift ships out of the water on a huge cradle, dispersing the weight on multiple rails and hundreds of wheels. 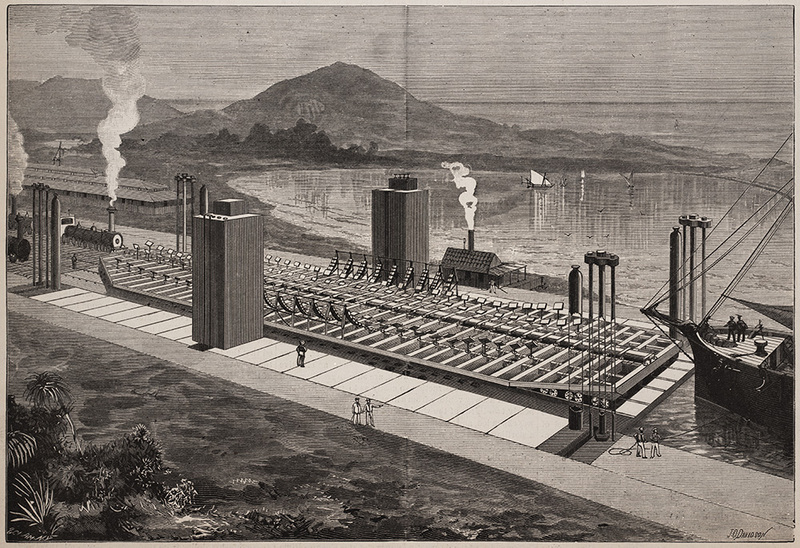 Huge locomotives, five times as large as any then in existence, would pull the ship across the Isthmus at 10 miles per hour, completing the entire transit in 16 hours. The U.S. Senate approved the plan in 1887, but the House bill to support it was blocked and never came up for a vote. Lifting pontoon and cradle for Eads’ proposed ship railway. From Scientific American, December 27, 1884. 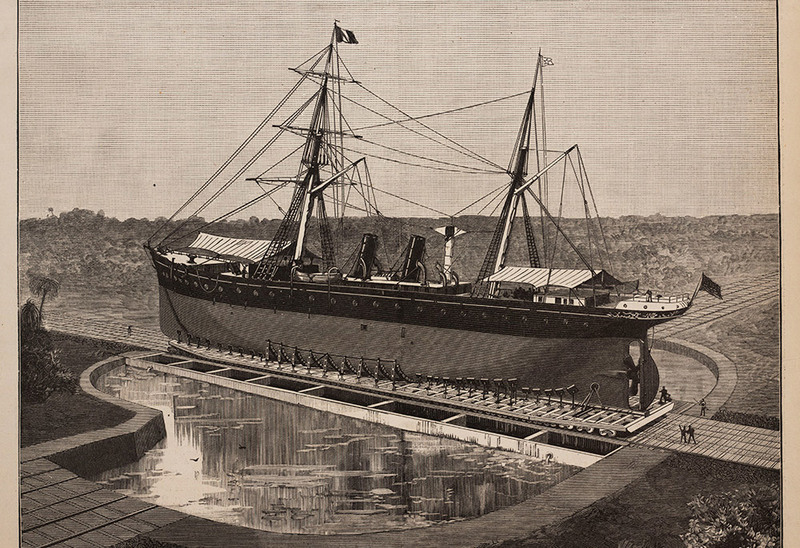 Floating turntable for Eads’ proposed ship railway. From Scientific American, December 27, 1884. 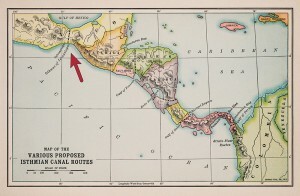 Route of Eads’ ship railroad across the Isthmus of Tehuantepec. From W.F. 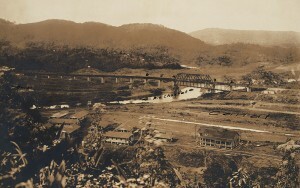 Johnson, Four centuries of the Panama Canal, New York, 1907. Central America has two narrow necks of land that separate Atlantic and Pacific waters. The Isthmus of Panama is 50 miles across, while Mexico’s Isthmus of Tehuantepec is 134 miles. While Panama is wet and muddy, the Isthmus of Tehuantepec is dry. Gamboa is located on the Chagres River, at a point near the Continental Divide where the river feeds into man-made Lake Gatun. 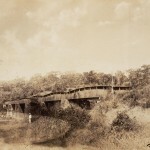 The original Gamboa Bridge across the Chagres was abandoned, since the creation of Lake Gatun plunged the bridge and most of the original railroad to the bottom of the lake. The new bridge was designed and built to rise on piers that would hold it above the level of the new lake and river. The bridge is still in use, carrying traffic on the new Panama Railroad across the Chagres River, next to the Panama Canal. 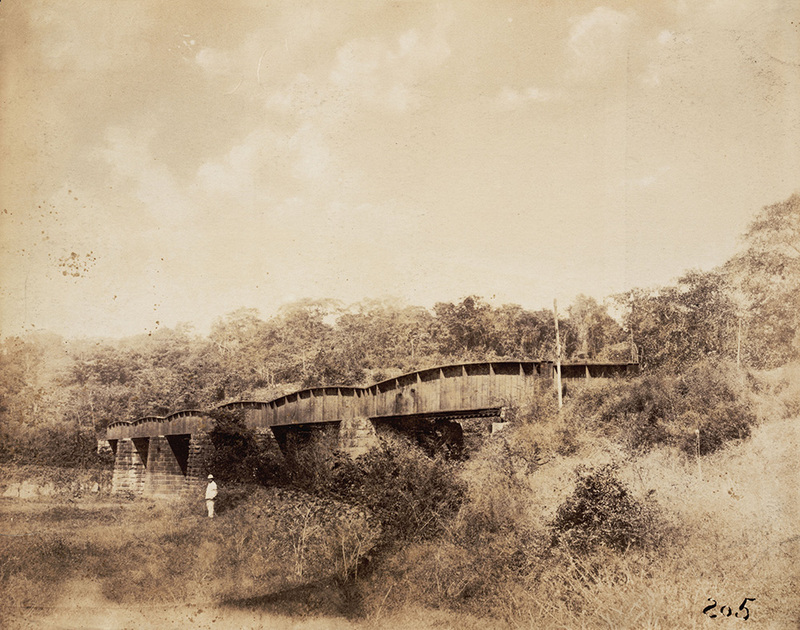 The foreground in this photograph of the Gamboa Bridge was destined to become part of Lake Gatun. The channel for the canal runs parallel to the bridge, and ships pass the bridge daily as they transit the Panama Canal. In 2012, a large cargo ship lost control at the point marked “canal” on the photograph and nearly collided with the bridge before it was stopped. 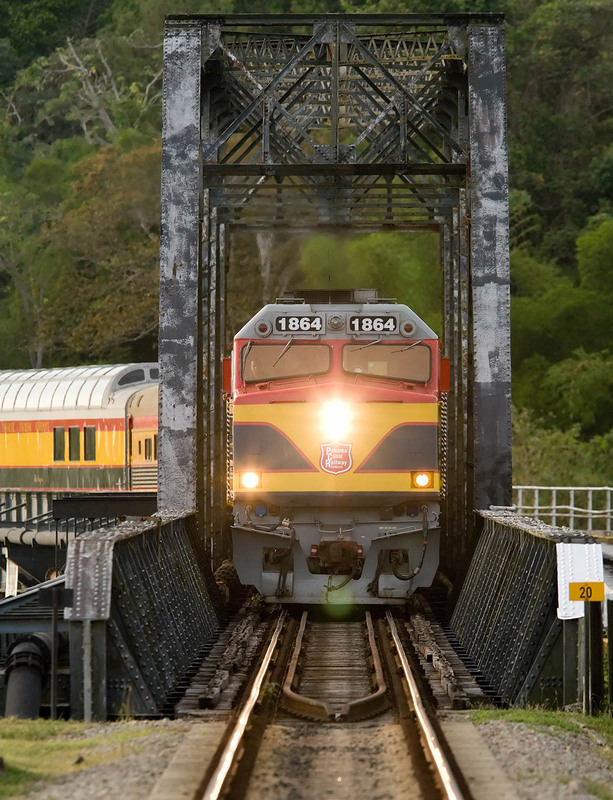 The Gamboa Bridge, in use today by the The Panama Canal Railway.